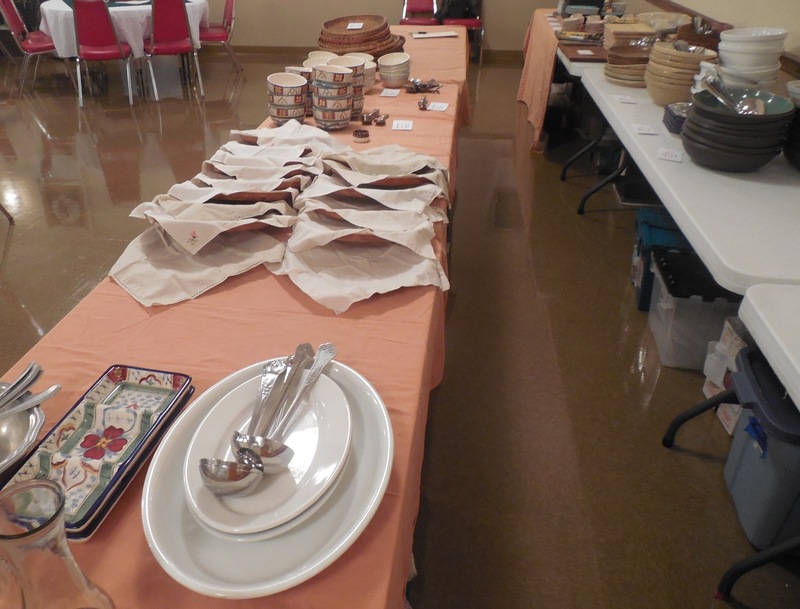 An hour before a banquet starts, dishes for the food of the first course are laid out in the service work area. The Guild serves “family style” to tables of eight to ten diners. The Guild has a stock of equipment: pots, pans, tools, kitchen prep containers, and serving dishes enough to prepare and serve a banquet for more than 150 people. This equipment is occasionally loaded to other people in SCA chapters to produce feasts. A kitchen head working on an SCA banquet who would like to borrow any Guild equipment, please go to the Contact Us page and send a message to our Guild Head. We are willing to loan out our equipment to guild members and other local SCA groups but desire that borrowers follow these guidelines: Please contact us if you would like to borrow equipment or have any questions. 2) The person who arranges the loan will have to sign a small form, which states how much dish tax, if any, will be charged. The dish tax is a per-head fee, which the Culinary Guild uses to replace lost and stolen equipment, to replace worn out equipment, and to buy new equipment. 3) The form also says the person responsible agrees to compensate the Guild if a major disaster occurs and a large amount of equipment is destroyed. This is above and beyond the dish tax which is for more “normal” loss and breakage. 4) The person responsible agrees to provide an outline of the equipment needed and understands that the equipment will be checked out and back in on a count sheet. 5) The person responsible agrees to make reasonable arrangements to pick up and return the equipment. “Reasonable” means no last-minute panic pickups. 6) The person responsible agrees to treat our equipment well and convey the boxed equipment under waterproof cover in cases of inclement weather during transport. 7) The responsible person agrees to clean the equipment and return it in the condition in which it was taken away: dry, packed neatly and safely in the containers provided.